Pakistani students of Islamic seminaries chant slogans during a rally in support of blasphemy laws, in Islamabad, Pakistan, March 8, 2017. This week three bloggers were ordered held while blasphemy charges are being investigated. An anti-terrorism court in Pakistan has put three online bloggers in the custody of a federal agency for a week so it can investigate blasphemy charges against them and determine whether they should be formally tried and punished. Pakistan’s Federal Investigation Agency, or FIA, arrested the three men earlier this week as part of an ongoing crackdown on suspects involved in posting blasphemous material on social media. Authorities say that laptops of the detainees have also been seized for forensic analysis. 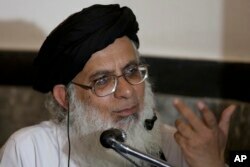 Pakistan's radical cleric Maulana Abdul Aziz addresses a news conference in Islamabad, Pakistan, March 24, 2017. Pakistani police have blocked a rally by clerics seeking to press their calls for the death of social media activists accused of insulting Islam. Pakistan’s anti-blasphemy laws carry the death penalty for insulting the Prophet Mohammad and imprisonment for life for insulting the Muslim holy book of Quran, though no one has been executed. Sharif also directed authorities to find those responsible for publishing blasphemous content on social media and swiftly bring them to justice. The crackdown has alarmed rights groups, particularly after five bloggers critical of Pakistan’s powerful military and its spy agency vanished in January. They were later returned to their families. They have since accused Pakistani security institutions of being behind their kidnapping. Shortly after they went missing, radical clerics and hardliners through television interviews and talk shows accused the bloggers of committing blasphemy through online activities. The five men have fled Pakistan because even allegations of blasphemy can provoke Islamists to kill those suspected of it. A provincial governor, a federal minister and members of non-Muslim minority communities have been among those killed in Pakistan for criticizing or seeking reforms in the anti-blasphemy law, or for being wrongly accused of insulting Islam. Pakistani officials have also contacted Facebook and Twitter to request them to identify Pakistanis outside the country who are posting anti-Islam material so the government can pursue their extradition and prosecute them at home. Federal Interior Minister Nisar Ali Khan announced this month that a Facebook delegation is to visit Pakistan soon to discuss the issue with his government. Rights activists and political opponents, however, allege the government through its stepped-up anti-social media campaign is trying to silence critics. They say that Pakistani officials are fully aware that social media outlets like Facebook and Twitter adhere to a strict policy to respect and protect the privacy of their users and the crackdown, as well as judicial proceedings under anti-blasphemy laws, are meant only to “induce a state of fear” to discourage political dissent and silence local media. Instead of stopping the abuse of blasphemy laws, the state is becoming a party to their misuse, observed Raza Rumi, editor at Pakistan’s English language Daily Times. “The state is not doing the public a favor. Beating the blasphemy drum further radicalizes the public, especially young men and women. … On the one hand, the civil and military leaders endlessly issue statements to fight extremism and on the other they are contributing to the extremism quagmire,” Rumi wrote in his latest article.